Alberto Salazar is an entrepreneur, passionate Java Consultant, JUG Leader, Auth0 Ambassador and founder of the Ecuador Java User Group, JCPAssociate Member and Java evangelist/trainer on Sun Microsystems time. He started up 10 years ago a consultancy company in Latin America and has been working and delivery JAVA solutions for more than 17 years for large scalable, high transaction load systems, from military software to banking solutions. He is recently co-author of the book ‘Mastering Architecting Solutions with Spring 5’. Alberto has long been a frequent speaker at Java conferences such as JavaOne, Oracle Code, Redhat Summit, Oracle Developer Tour Latam, Oracle OTN and locally JUGs. Q. Tell us a bit about yourself. What are your hobbies and interests? Hi, I’m Alberto Salazar (@betoSalazar), I’m a consultant on enterprise systems for almost 20 years and I am founder & director at Advance Latam who is a consultancy company that creates software mainly based on Open Source. I have the luck to participate in creating backbone components that process highly loads of request (military messaging systems, Banking Solutions). On the other side, my free time I enjoy it with my daughters and my wife. And I try to fit and accomplish my work on the Java Community as a JUG Leader, conference organizer, and speaker. Q. 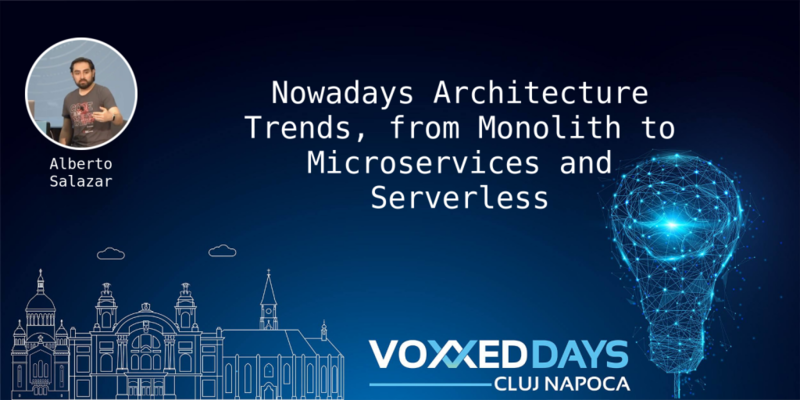 Why did you select this topic for your session at Voxxed Days Cluj-Napoca 2018? Nowadays, developers have several options in the matter of tools, architecture, infrastructure, etc. These trends are bothering everybody in matters to take a decision on how to create new software or how to evolve their enterprise systems. Through this talk, the audience will get tips and ticks gain on a trip to evolve a huge monolith application and lesson learned through this journey. Q. Who should attend your session? Anybody interested in a vision from a consultant of the technology trends that bother us right now as Serverless, Microservices, Reactive and our well knows monolithics. Q. What are the key things attendees will take away from your session? A vision of how to looks an application that brings value to the business areas after several years of code and will acquire some ways to evolve their code and architecture. Q. Aside from speaking at Voxxed Days Cluj-Napoca 2018, what is the year review look like for you? This years was really busy, In one side I spend almost every month giving talks and traveling and on the other side by this year I get honored as a Auth0 Ambassador and Oracle Groundbreaker ambassador (Ex Oracle Dev Champion Program), and also finish my book about ‘Software Architecture with Spring 5’. This year I also participate as a speaker in several conferences such us: Oracle Code in Colombia and Brazil, Oracle Code One – San Francisco, Javaday Brazil, Colombia, Ecuador and Guatemala. Q. What are your plans for the next year? I have not yet a complete plan for 2019, but I can anticipate that I will be part of the great DEVNexus conference in March. On the other side, I am going to organize the second edition of a Javaday Conference in Ecuador in September and I am planning a Hackday tour to bring Java skills to the youngest developers around Ecuador, traveling to small cities during each month.